Liberians, their country devastated by years of civil war, head to the polls in October 2005 in the most promising opportunity the country will have to establish a fragile, post-conflict democracy. Liberia's destroyed infrastructure, pervasive poverty, 85 percent illiteracy rate, and bitter electoral history are compounding the challenges of providing civic education and making technical arrangements for the election process. 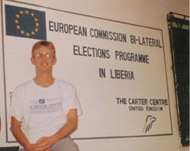 The Carter Centre U.K. and its London-based partner, Electoral Reform International Services, are collaborating in Liberia to implement a European Commission Bi-Lateral Elections Programme on voter education initiatives, training of domestic election monitors, and building the capacity of political parties. The project will help Liberian voters channel their aspirations for the future into participation in this important transitional political process. The project has two "Democracy Resource Officers" based in each of the three rural resource centres - Gbarnga (Bong county), Harper (Maryland county), and Voinjama (Lofa county). These officers work closely with local election officials, civil society organizations, and political party representatives, managed by team leaders at the project headquarters in Monrovia. Democracy Resource Officer Jeff Austin, a former intern at The Carter Center, shares his experiences in the field. Two women wearing the white vests of the Liberian Red Cross knocked on our front gate this afternoon. They had been asking around for Jacob Taryer, and someone in the neighbourhood directed them to our compound. Jacob is our chief security guard. The women carried with them a letter from Jacob's nephew, who left Harper four years ago to join the Liberian civil war on the side of the MODEL rebels. Jacob and his family had long given him up for dead, as in so many other families in this war-weary nation, but today's letter said he was studying agriculture at a vocational school in Grand Bassa County supported by the European Union. "Dear Uncle," the letter began. "I extend my greeting to you and your entire family at this beautiful hour." He asked for news of his parents, and where he could find them. "I hope to be with you upon the close of my graduation in September 2005." Enclosed with the letter was a photograph of the nephew, now 22, standing with friends and wearing the emblem of his new school. Jacob wrote a reply and gave it to the women, who agreed to carry it back to his nephew. At long last, the Liberian campaign period officially has begun. At the market this morning in Harper, the local magistrate of the National Elections Commission used a megaphone to call together a crowd. He welcomed them to the new season and asked them not to tear down the posters of rival parties. This request was in line with a first-time-ever voluntary Code of Conduct signed by all registered political parties in Liberia this year. The streets had a new air almost immediately. Photocopied campaign posters had appeared over the night on storefronts down town. Near the street corner where young men sell diesel from old bottles of beer, a man with a megaphone was shouting the praises of one of the 22 contending political parties. From the second-floor offices of another party, a crowd of partisans awaited the arrival in town of its senatorial candidate. And a bus filled with people shouting the name of one of the 22+ presidential aspirants passed us as we drove away from the centre of town on Maryland Avenue. I have just returned to base from a three-week tour of the southeast, where I completed the final round of workshops for rural party offices and met with our partner organizations conducting voter education. Cell phone service came to Harper while I was away. Land lines haven't functioned in Liberia for many years, and when I arrived in April, cellular service was restricted to Monrovia and a handful of other population centres. From my first day in Harper, I heard rumours that the tower on top of the abandoned Masonic temple, down by the port of Cape Palmas, would be up and running soon. It finally is. Previously, my only option for staying in touch with headquarters was borrowed Internet time at the offices of the World Food Programme and an occasional exchange of words over satellite phone. As the race toward Election Day quickens (the official campaign period begins in one week) and as the bulk of our comprehensive voter education program unfolds, communications will be vitally important to my own work as well as the myriad other local and international organizations conducting election efforts in this region. Of course, the cost of air time is far beyond the reach of the average Maryland farmer, but stalls are popping up along the street side where locals can pay a few cents to call a relation or friend in another part of the country. The four security guards who watch our field office are considering taking out a micro-loan to go into business and open a booth together. This week one of our civil society partners is travelling the county by motorcycle for another round of meetings with the 80 poll watchers who will keep an eye on the election day balloting. Thomas Mawolo, the local representative of the Justice and Peace Commission, is back in Harper after a meeting at our headquarters in Monrovia. I helped recruit the JPC, a Catholic advocacy group in the liberation theology vein, to post neutral election observers at all the polling stations in Maryland County. They will join with about 500 others in four more parts of the country to safeguard the transparency of the process on October 11 under the banner of the European Commission Bi-Lateral Election Programme in Liberia. The October elections will be well watched by a number of international organizations, including The Carter Center in Atlanta (an associate organisation of our project), which has the only foreign long-term observers already touring the country. But the observation component of the EC Bi-lateral Programme recognizes the advantages of local observers as well: they know the fault lines of influence here better than any outsider ever can, they carry their new understanding of election procedures back to their own communities, and they contribute to a government-watchdog culture that will remain relevant after the elections have come and gone. Mr. Mawolo has already recruited the observers we will need in two months time. This week he is meeting with them to brief them on recent developments and invite them to the comprehensive trainings he will conduct next month. Our final workshop on seat allocation for the ERIS/Carter Centre U.K.'s election programme in Liberia took Lillian and me to Grand Kru county last week. We travelled by car to the end of the sole road in Liberia's most isolated county and loaded our belongings into a canoe to cross the Nuhn River. We were lucky to be travelling with a United Nations convoy. An Ethiopian peacekeeper found us on the other side. His truck had come by helicopter three months earlier. Grand Kru represents the end of the line in Liberia. The war drained this county's population from 200,000 to 71,000, according to U.N. estimates. The largest peacekeeping operation in the world (15,000 troops) has deployed in every part of Liberia except here. Seventy Ethiopians only guard the accordion-wire camp where a handful of expatriate U.N. civilians are promoting elections and rebuilding local government. The party agents we met at the Grand Kru workshop were hungry for information. Without phone service, access to print media, or the chance to listen to FM radio, they are desperate to learn all they can about the elections when outsiders like us make a rare trip to see them. We gave the assistant county magistrate of the National Election Commission a chance to answer questions, and many of the partisans said it was the first time they had met anyone in that office. Locals call Grand Kru "walking county." The U.S. ambassador recently announced that the U.S. Agency for International Development would build a bridge over the river. That may lead to the construction of new roads, but, for now, two-thirds of the county is accessible only by foot. Barclayville, the capital, has no restaurants and no stores selling food. We had to beg a can of sardines off a Belgian U.N. officer and negotiate with a villager to eat rice and potato-leaf soup from her kitchen. The U.N. was generous to us that night. We reported to headquarters over an incongruous satellite Internet connection and slept on cots in a military-issue tent. In the morning, after discussing the elections with youth leaders and local chiefs, a hunter offered us a live baby antelope for about USD $3. We declined, and crossed back to our side of the Nuhn to start our return trip to Harper. For more than a week now, ERIS/Carter Center U.K. staff have been living and breathing "legislative seat allocation" in Liberia. Moses Pitso, our South African director of political party assistance, explained the revised process to me on June 15. I have pulled out registration data and pen and paper to run through the numbers with just about everyone I meet: the Catholic priest who opened his mission in Zwedru to us when we could find no other place to stay; the woman who serves fried eggs at the tea shop near our house; and the pack of young men who staff the local radio station. One of our security guards invited Lillian Kilwake, my Kenyan counterpart, and me to explain the mathematics behind legislative seat allocation at a weekly meeting of Barrobo District residents living in Harper. As in the United States, Liberia's Senate represents the country's subdivisions equally, but a county earns seats in the lower chamber according to its proportion of registered voters, a proxy for population in a country that hasn't done a census in more than 20 years. The electoral reform law passed in December mandated each county have at least two seats in the House of Representatives, but left vague whether a county would receive those up front, or only if it otherwise wouldn't have earned them by virtue of population. The very day we conducted a workshop in Harper explaining to local party offices the National Elections Commission's original interpretation of the law, as their leaders in Monrovia were complaining to the NEC that the formula placed small counties at an unfair disadvantage. It was an issue that had largely been ignored until the ERIS/CCUK programme began focusing attention on it at workshops in Gbarnga and Tubmanburg and later in Buchanan and Zwedru. When the NEC acquiesced to sudden pressure to automatically provide two seats at the start of the delimitation process (the process that determines how many seats would be allocated to each county), we wondered whether our work had encouraged the parties to make it a priority. This week, Lillian and I quickly put together a series of workshops in each of the three southernmost counties to explain the new process. At the same time, our attention is turning toward the public exhibition period that begins June 30, when all people who registered to vote in April and May will be able to return to the registration centres and verify their inclusion in the voter rolls. We have been distributing an educational film on this topic that features Liberia's favourite comedian to movie houses around Harper and have arranged to fund the transportation costs of two awareness projects for the farthest districts of the county. In the meantime, we are travelling back to the capital to attend training on Liberia's campaign finance law governing political parties. Last week, on a return trip from a series of headquarters meetings in Monrovia, Liberia's capital, our vehicle detoured through Maryland County's remote northernmost district, Barrobo. A downed bridge forced the change of route; Chinese engineers employed by the United Nations were making repairs. On the logging road through Barrobo, we found the village of Juluken, and in Juluken we saw an unfamiliar sight: a herd of cows. "The war never came here," explained a physician's assistant catching a ride in our Nissan four-wheel drive to the Catholic clinic in Harper, a regional capital and the site of the ERIS/ Carter Centre U.K. field office where I am stationed. He was speaking really of two wars-the 1990 war that ended with the election of its leading proponent, Charles Taylor, to the presidency in 1997 and of the havoc wreaked by Movement for Democracy in Liberia (MODEL) rebels between 2001-2003. MODEL was one of a pair of twin insurgencies that plunged the country back into chaos until a peace agreement put a fragile peace in place two years ago, a peace now supported by the largest U.N. peacekeeping force in the world. In this part of the countryside, the cows have mostly been shot. Farmers, afraid of more conflict that will destroy their land, lack enough faith in their future to plant vegetables, and refugees over the border in Côte d'Ivoire are awaiting the outcome of October's scheduled presidential and legislative elections before they decide whether to come home. Juluken was fortunate to host a voter registration site during the four-week process that ended May 21. Villagers less fortunate had to walk two hours or more to ink their thumbs and receive photo I.D. cards. In two months of meetings across the southeast of this country with political party agents, civil society leaders and woman who sell their goods at the market, I have heard repeated concern that basic knowledge about the process never reached smaller towns and villages. The education efforts of the transitional Liberian government and the international community, through nongovernmental organizations such as The Carter Centre UK and ERIS should have been more extensive. Nevertheless, the latest figures at the air-conditioned and state-of-the-art data centre in the capital indicates 1.2 million Liberians and counting signed up to vote. The country lacks the census information to put that number in context, but it's a two-to-one margin over 1997. For all their worry, Liberians also say this year is their chance to "get it right." In addition to civic education, the role of our six field officers, in collaboration with staff at our main office in Monrovia, is to build the capacity of local party bureaus to engage in a healthy democratic process, assist the National Elections Commission in the balloting and support the efforts of domestic monitors and observers to guarantee its credibility. Everywhere I go, I find enthusiasm but the same stories-the party agents don't know what their leaders in Monrovia are saying, civic groups desperate to take the word of elections to the countryside don't have vehicles, and youth leaders can tap into broad strata of the society if only someone would tell them how many seats their county will have in the House of Representatives. These are problems that an organization with the experience and resources of The Carter Centre U.K. and ERIS can help solve. The author in Harper, Maryland County, Liberia. Carter Centre U.K. and ERIS staff at the Monrovia office. The new Carter Centre U.K.-ERIS resource center in Voinjama and the construction workers who built it.